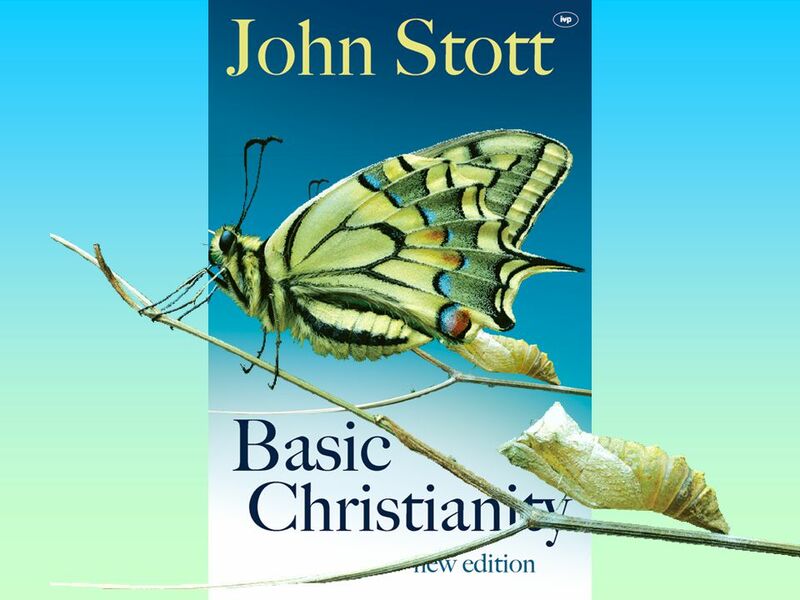 Basic Christianity. 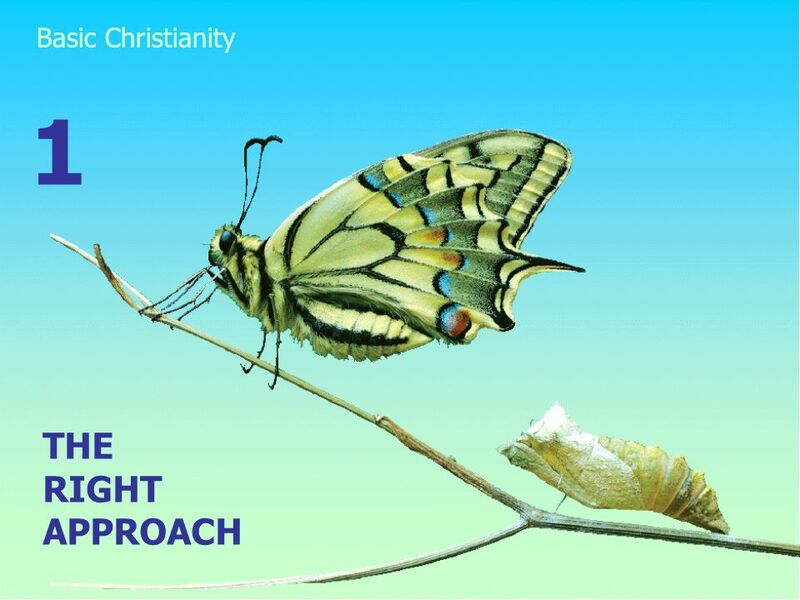 THE RIGHT APPROACH 1 Basic Christianity God takes the initiative. 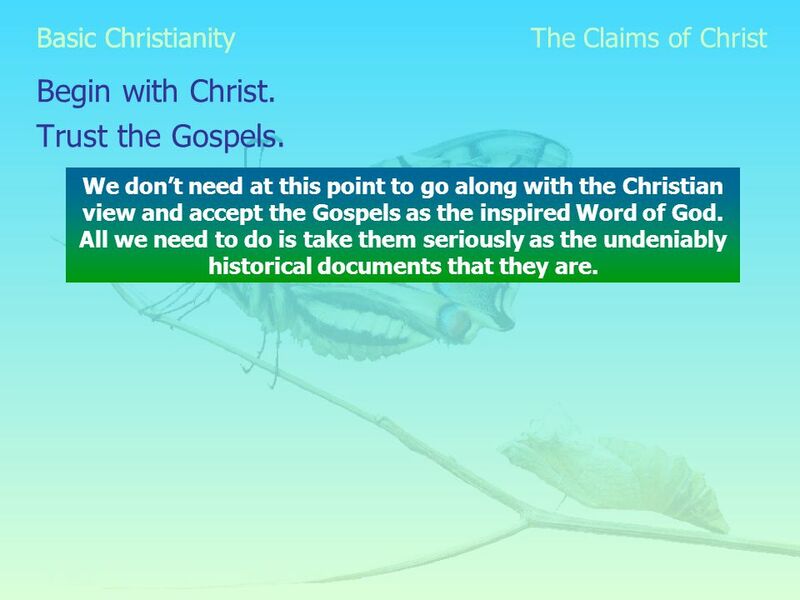 The Right Approach The Bible reveals a God who, long before it. 4 Basic Christianity God takes the initiative. 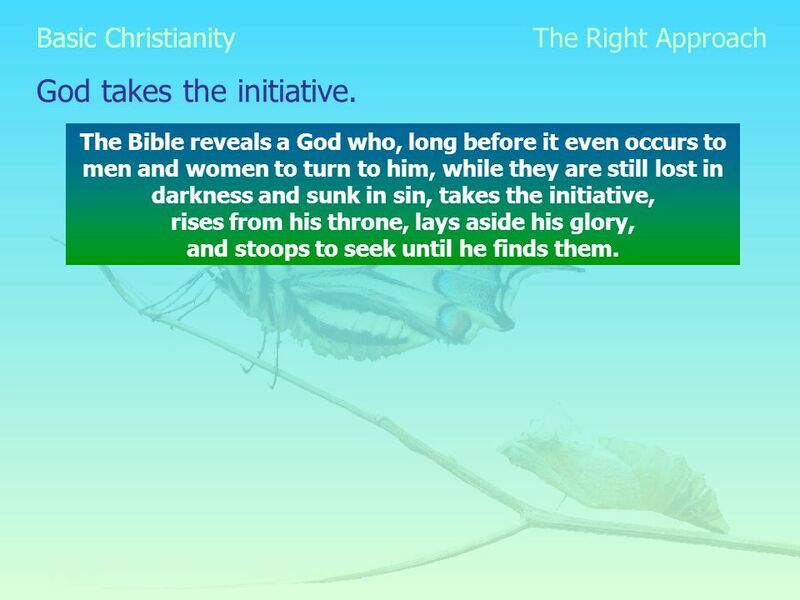 The Right Approach The Bible reveals a God who, long before it even occurs to men and women to turn to him, while they are still lost in darkness and sunk in sin, takes the initiative, rises from his throne, lays aside his glory, and stoops to seek until he finds them. 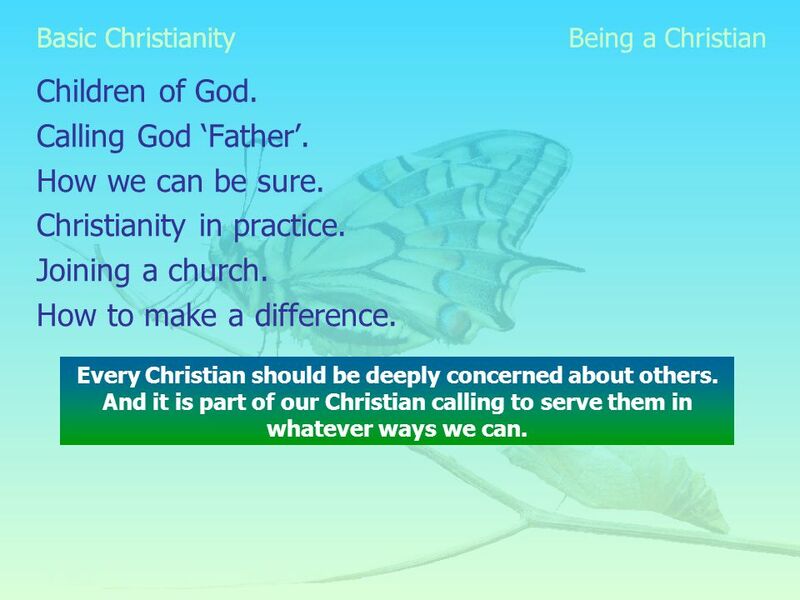 5 Basic Christianity God takes the initiative. 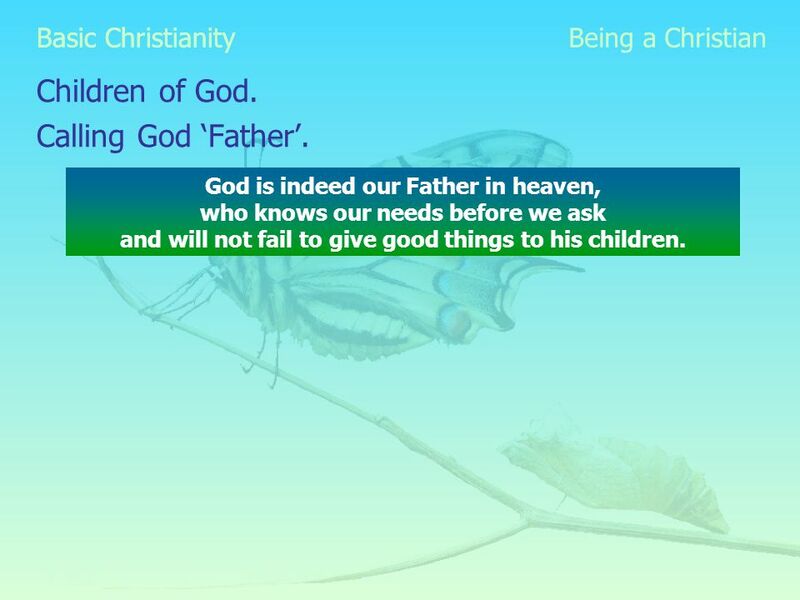 God makes himself known to us. Right The Approach God has spoken. He has taken the initiative to make himself known. 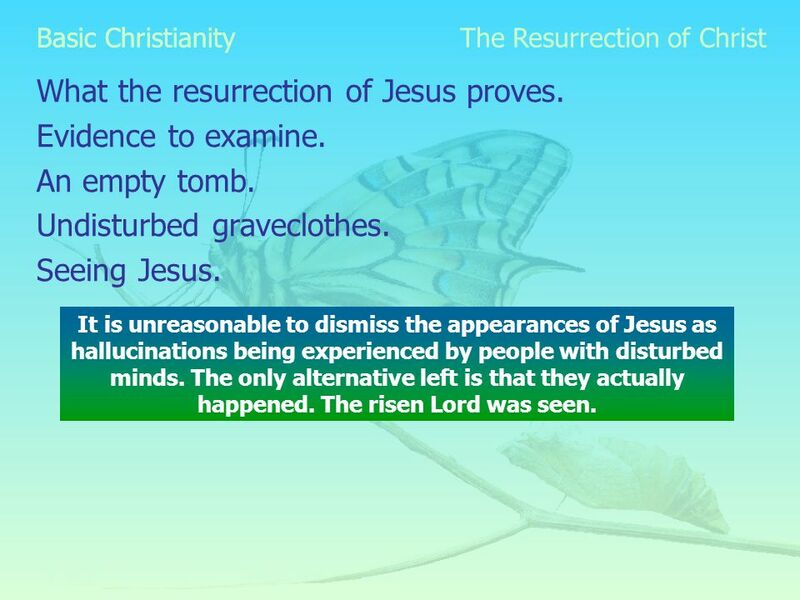 The Christian concept of revelation is essentially reasonable. 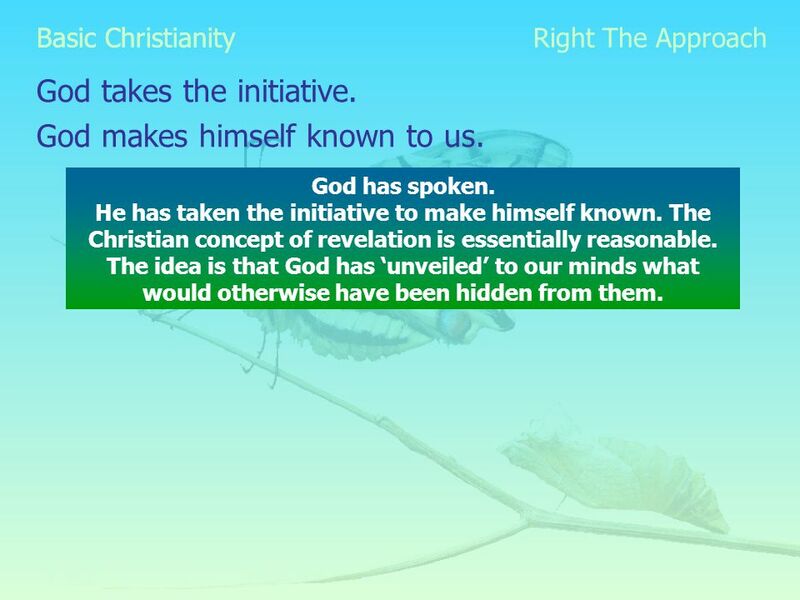 The idea is that God has ‘unveiled’ to our minds what would otherwise have been hidden from them. 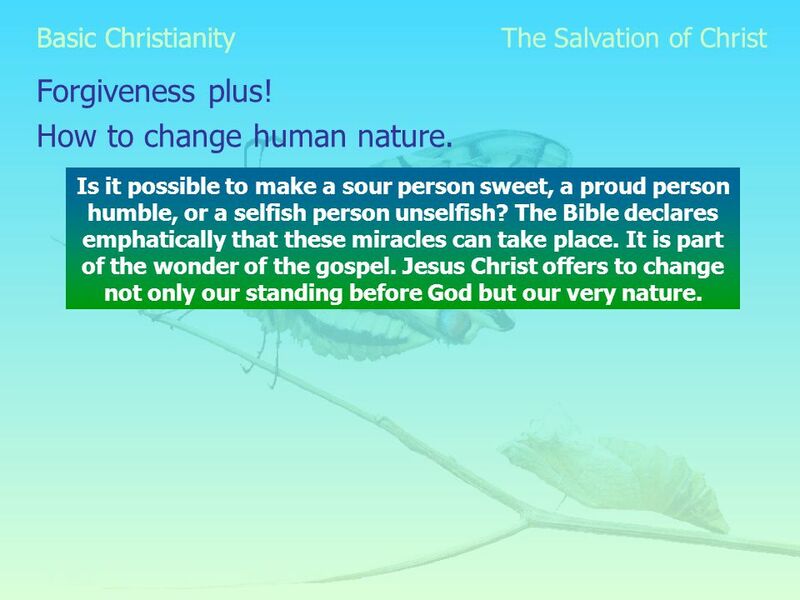 6 Basic Christianity God takes the initiative God makes himself known to us. But it isn’t enough! 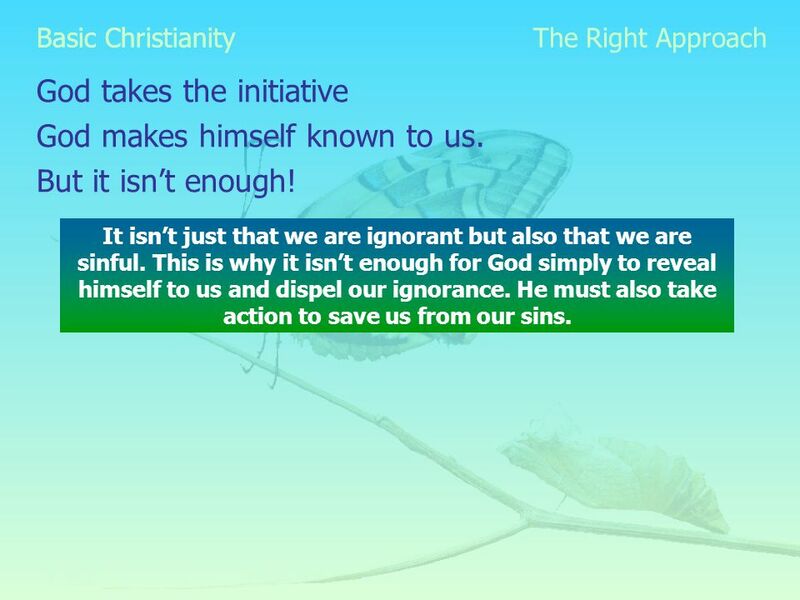 The Right Approach It isn’t just that we are ignorant but also that we are sinful. 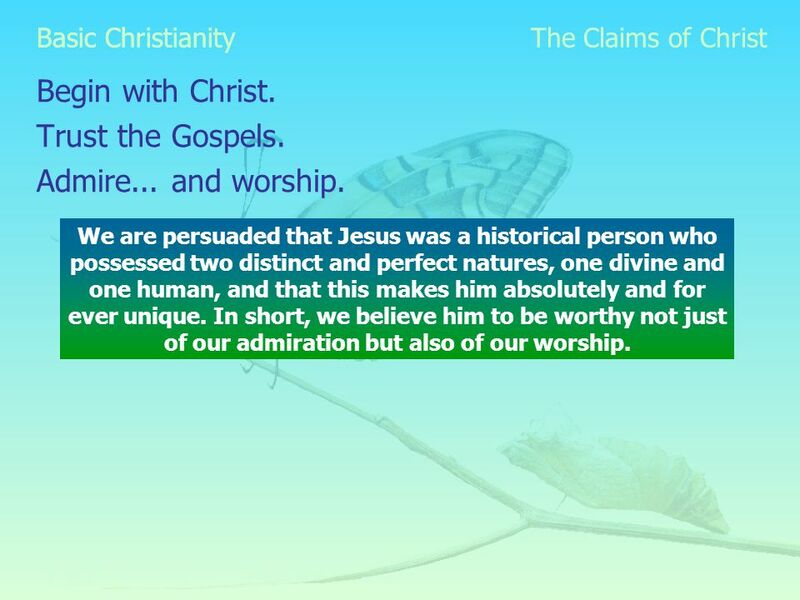 This is why it isn’t enough for God simply to reveal himself to us and dispel our ignorance. He must also take action to save us from our sins. 10 Basic Christianity Begin with Christ. 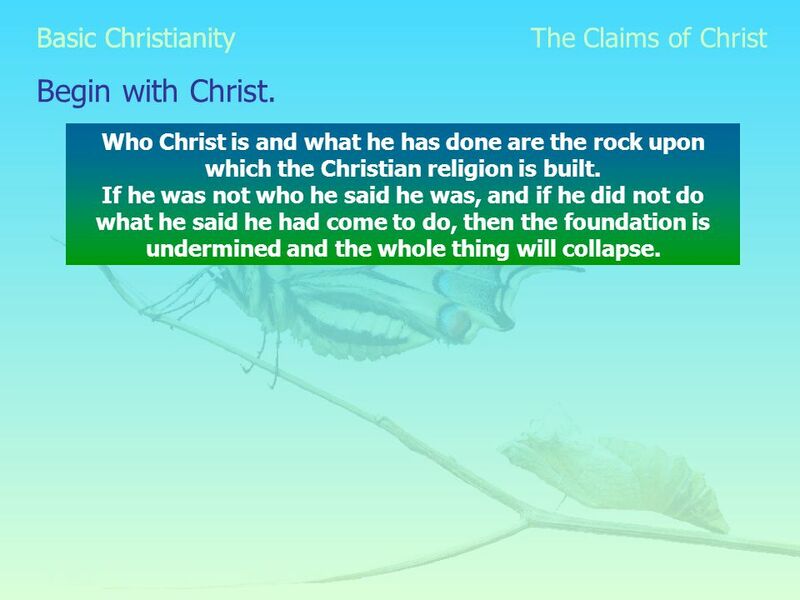 The Claims of Christ Who Christ is and what he has done are the rock upon which the Christian religion is built. 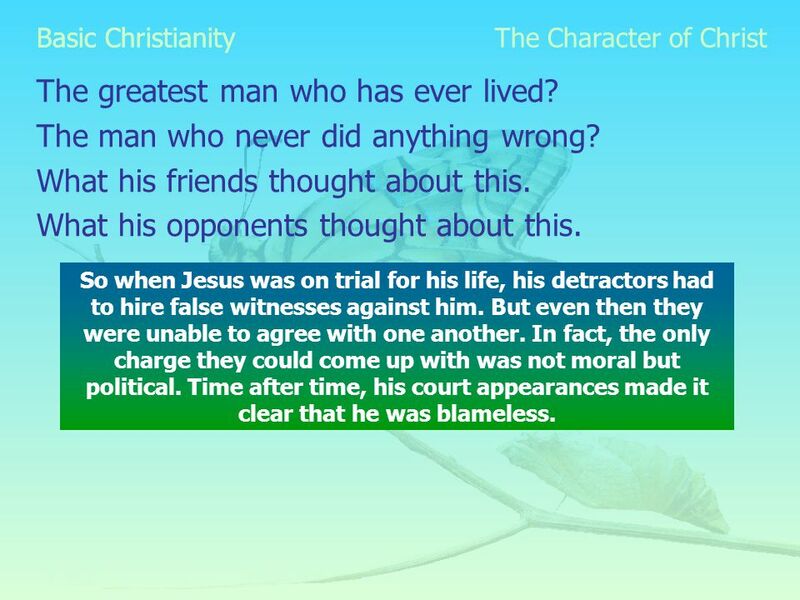 If he was not who he said he was, and if he did not do what he said he had come to do, then the foundation is undermined and the whole thing will collapse. 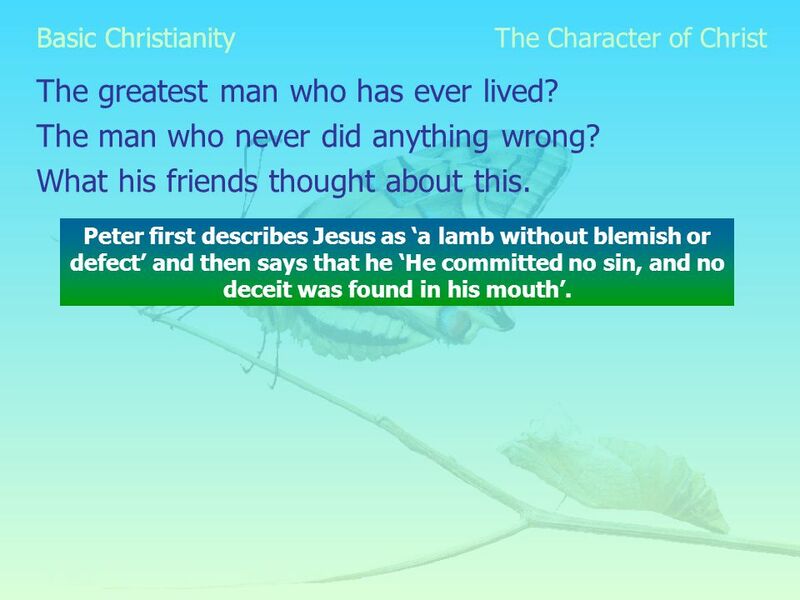 18 Basic Christianity The greatest man who has ever lived? 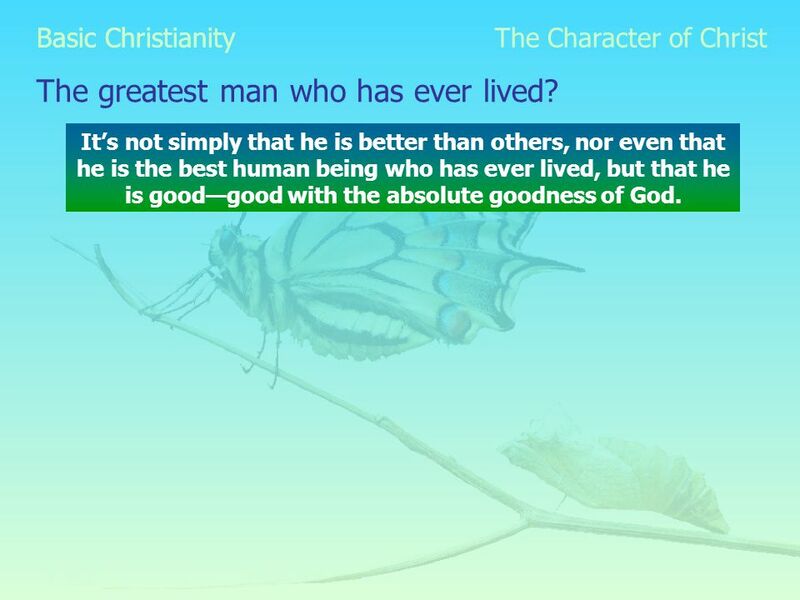 The Character of Christ It’s not simply that he is better than others, nor even that he is the best human being who has ever lived, but that he is good—good with the absolute goodness of God. 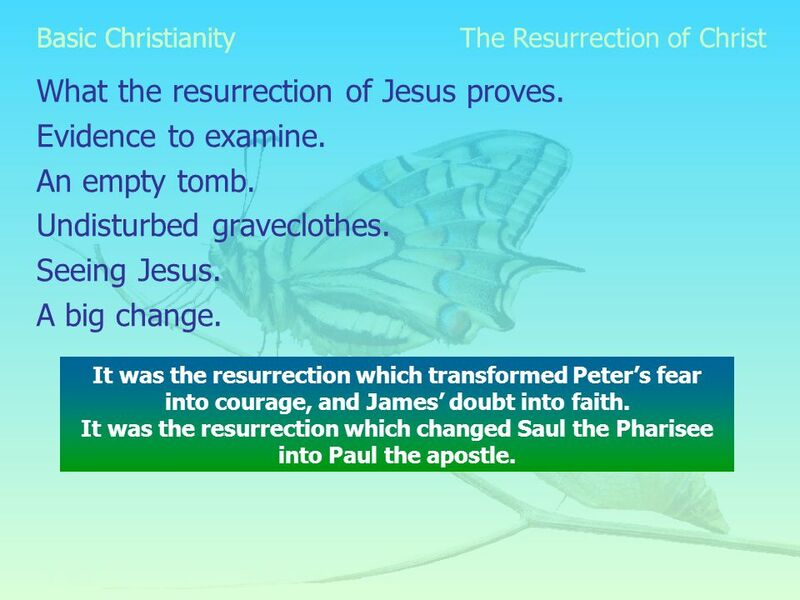 26 Basic Christianity What the resurrection of Jesus proves. 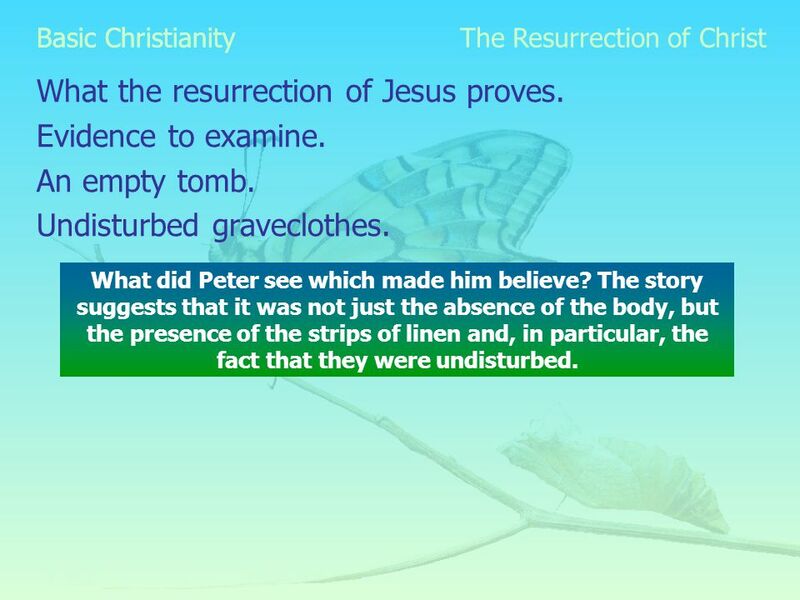 The Resurrection of Christ The argument is not that his resurrection establishes his deity, but that it fits with it. 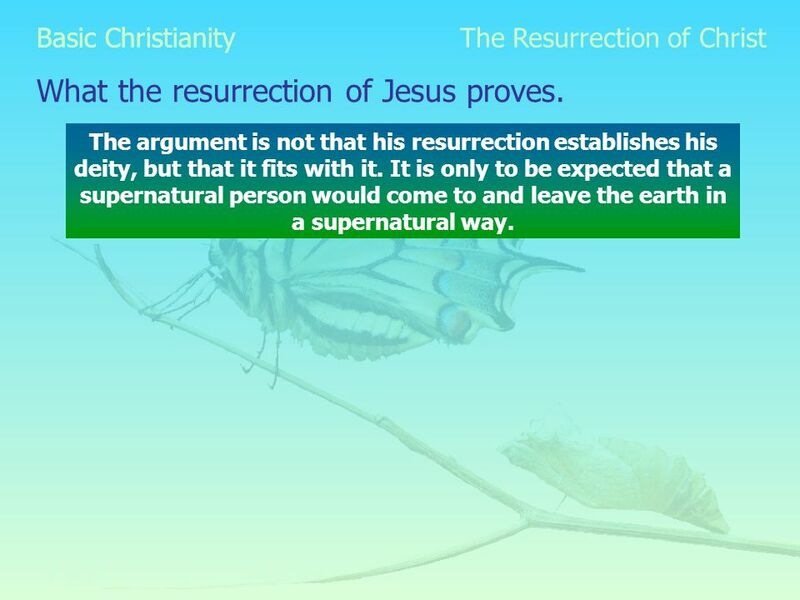 It is only to be expected that a supernatural person would come to and leave the earth in a supernatural way. 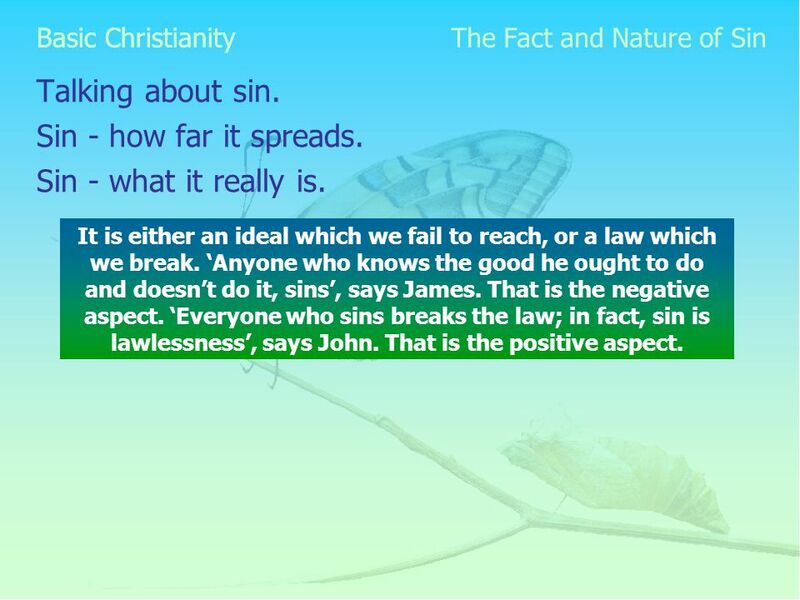 34 Basic Christianity Talking about sin. 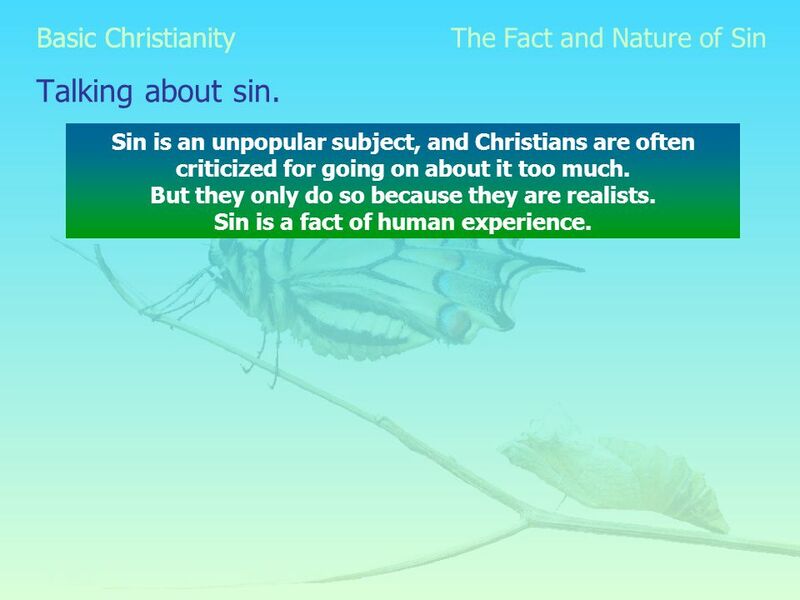 The Fact and Nature of Sin Sin is an unpopular subject, and Christians are often criticized for going on about it too much. But they only do so because they are realists. Sin is a fact of human experience. 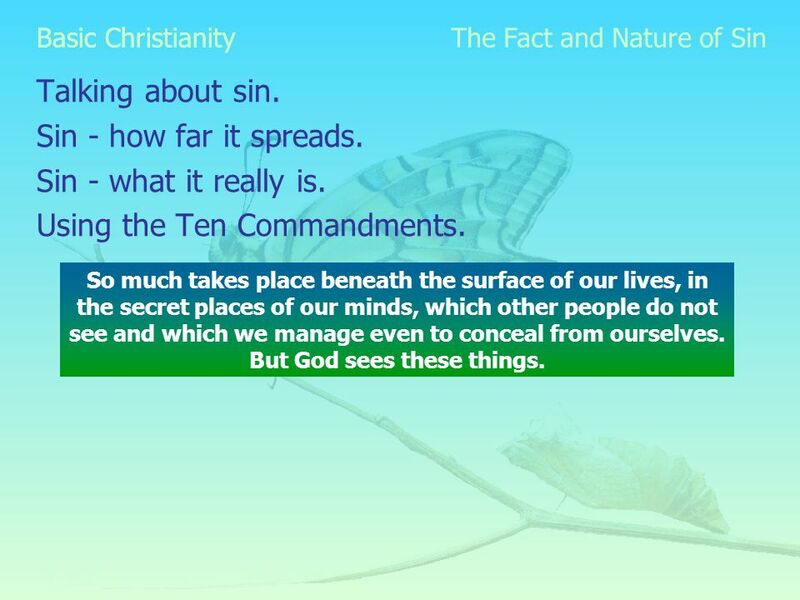 40 Basic Christianity Sin and God. 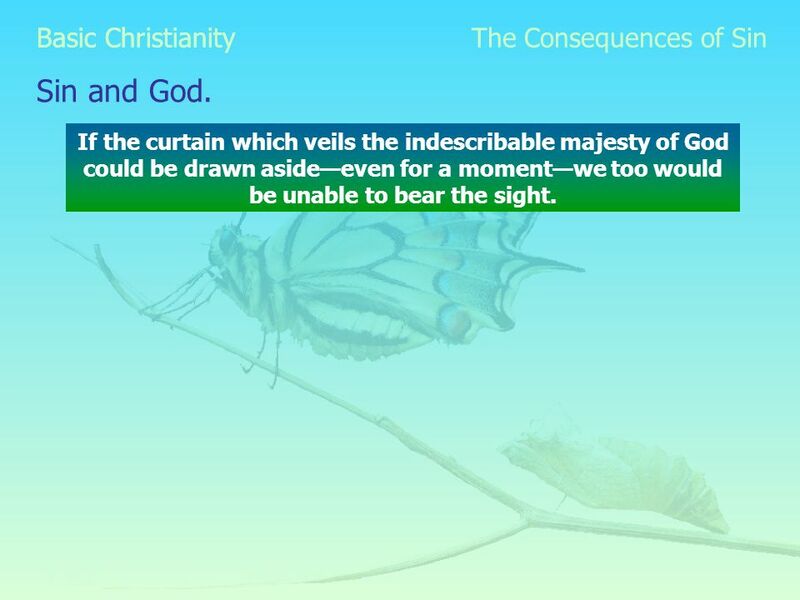 The Consequences of Sin If the curtain which veils the indescribable majesty of God could be drawn aside—even for a moment—we too would be unable to bear the sight. 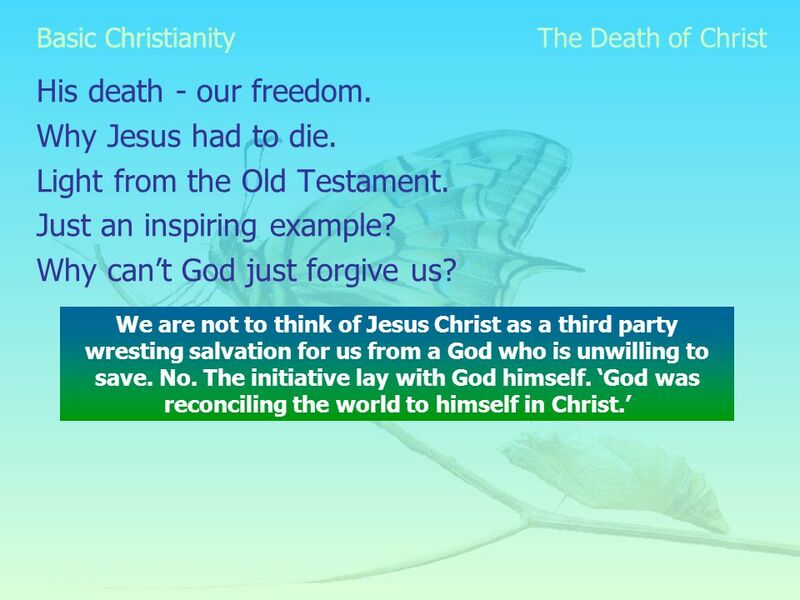 45 Basic Christianity His death - our freedom. 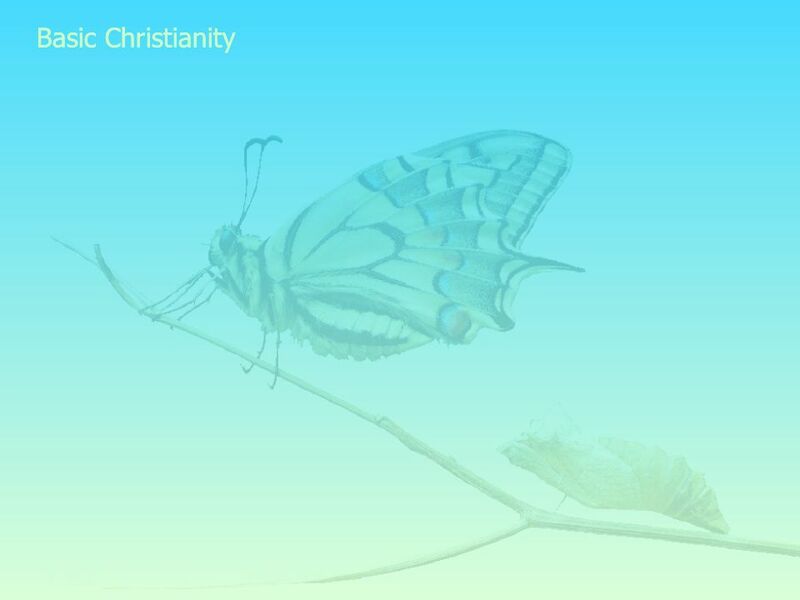 The Death of Christ Sin caused a separation between us and God; the cross, the crucifixion of Christ, has brought us back together. 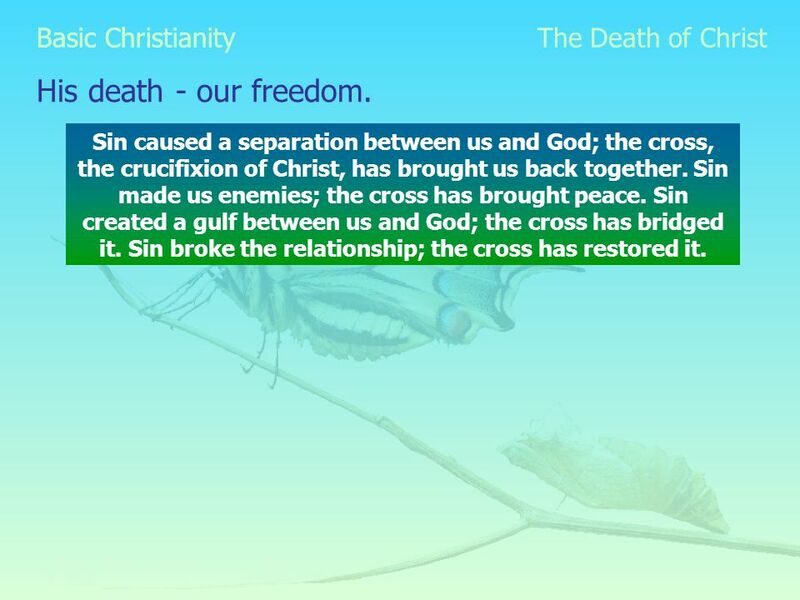 Sin made us enemies; the cross has brought peace. Sin created a gulf between us and God; the cross has bridged it. Sin broke the relationship; the cross has restored it. 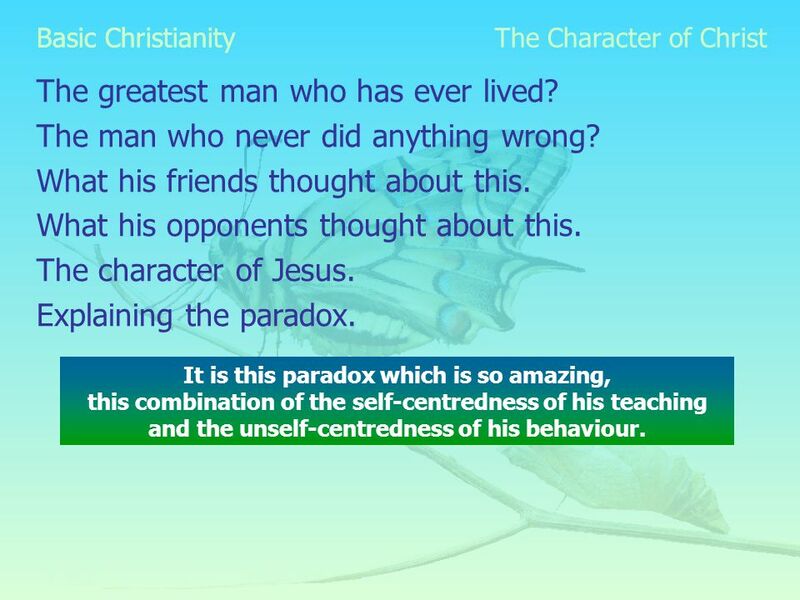 52 Basic Christianity Forgiveness plus! The Salvation of Christ God is as much concerned with our present and future as with our past. 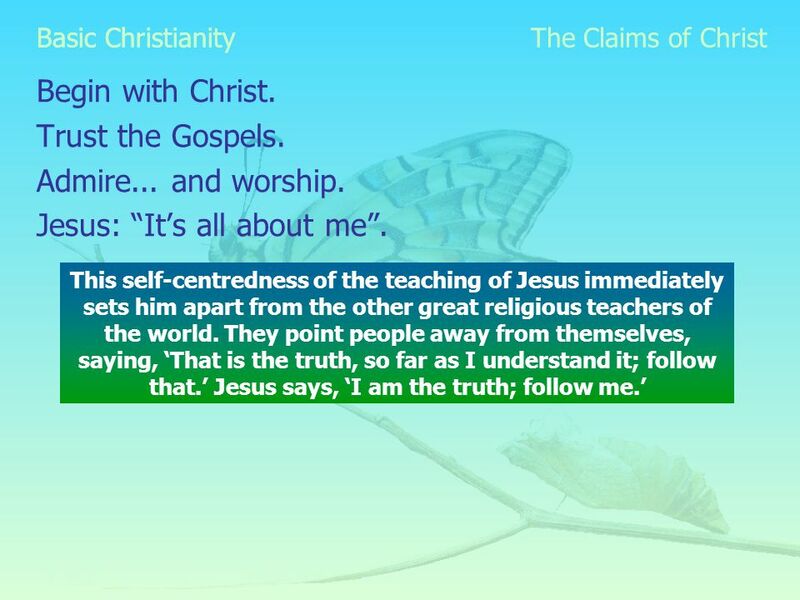 His plan is first to put right our relationship with him, and then progressively to set us free from our self-centredness and bring us into harmony with other people. 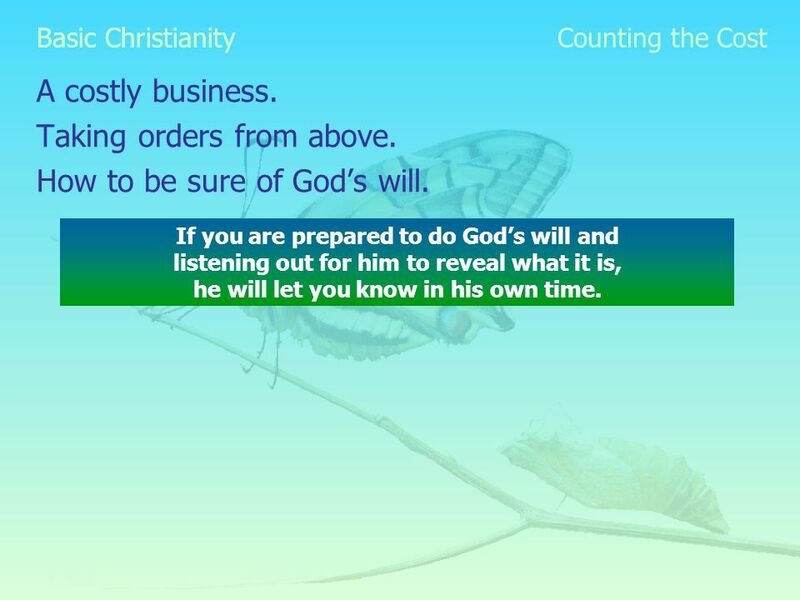 58 Basic Christianity A costly business. 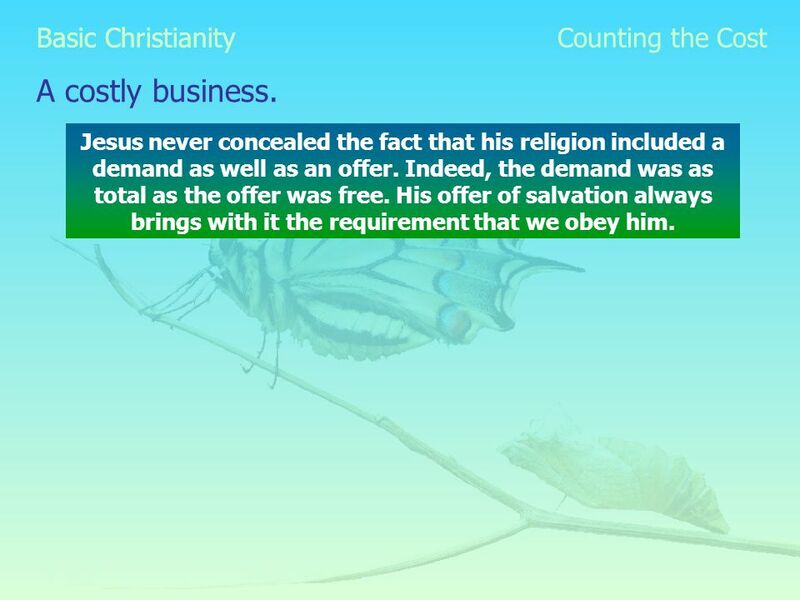 Counting the Cost Jesus never concealed the fact that his religion included a demand as well as an offer. Indeed, the demand was as total as the offer was free. 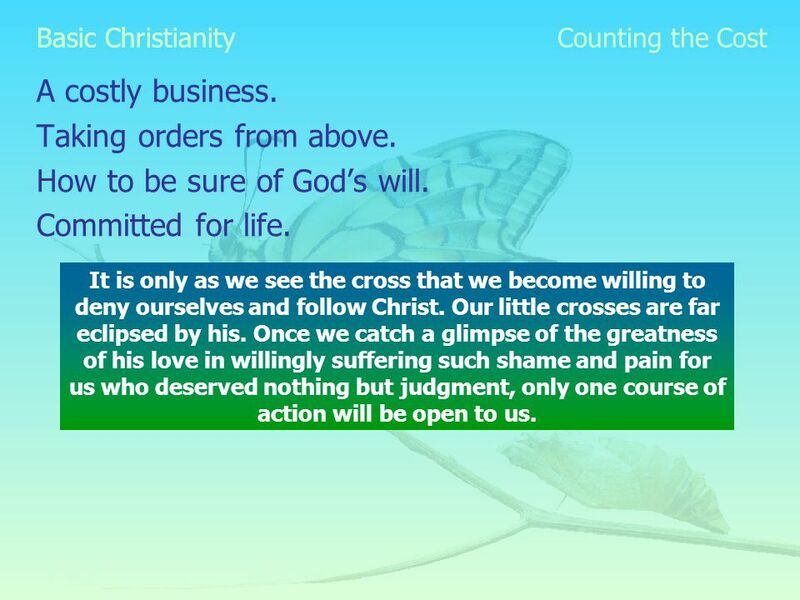 His offer of salvation always brings with it the requirement that we obey him. 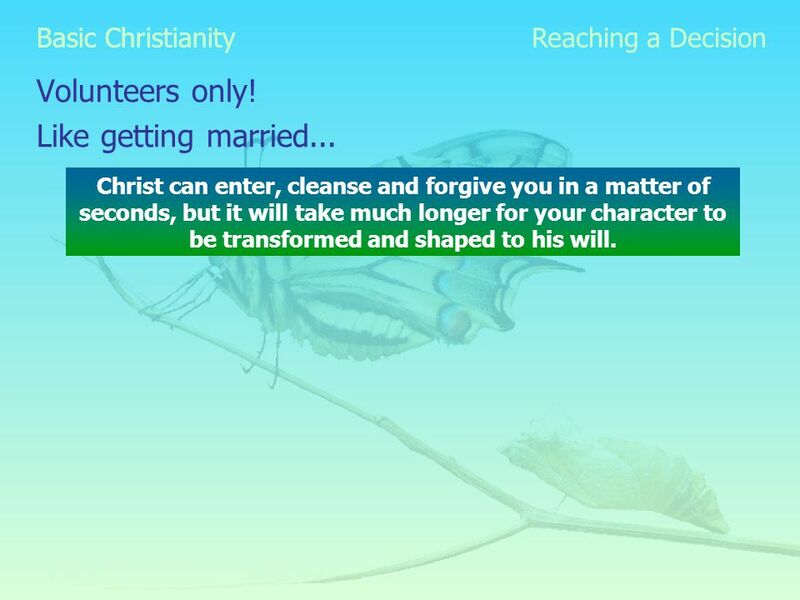 64 Basic Christianity Volunteers only! 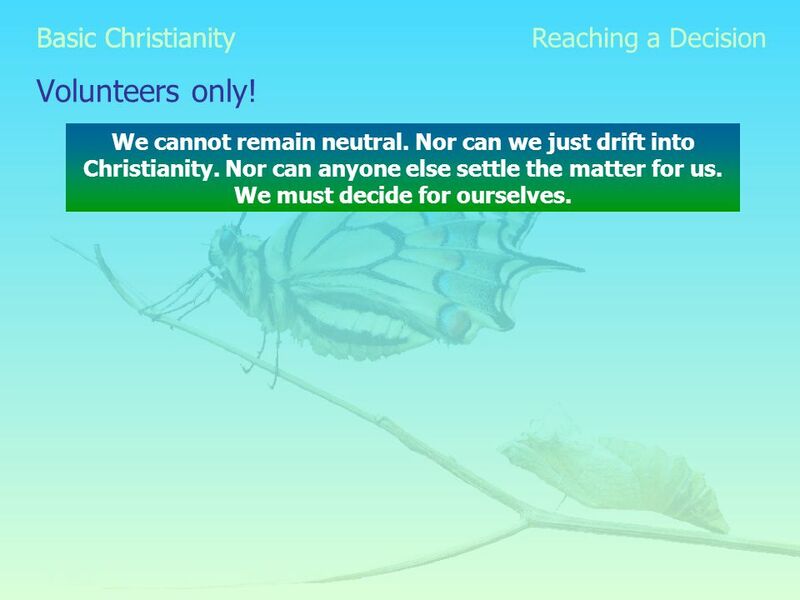 Reaching a Decision We cannot remain neutral. 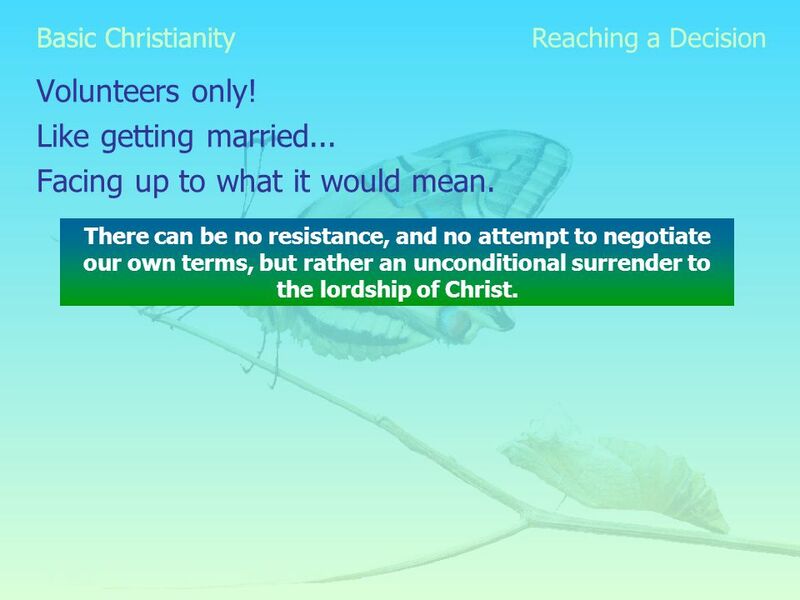 Nor can we just drift into Christianity. Nor can anyone else settle the matter for us. 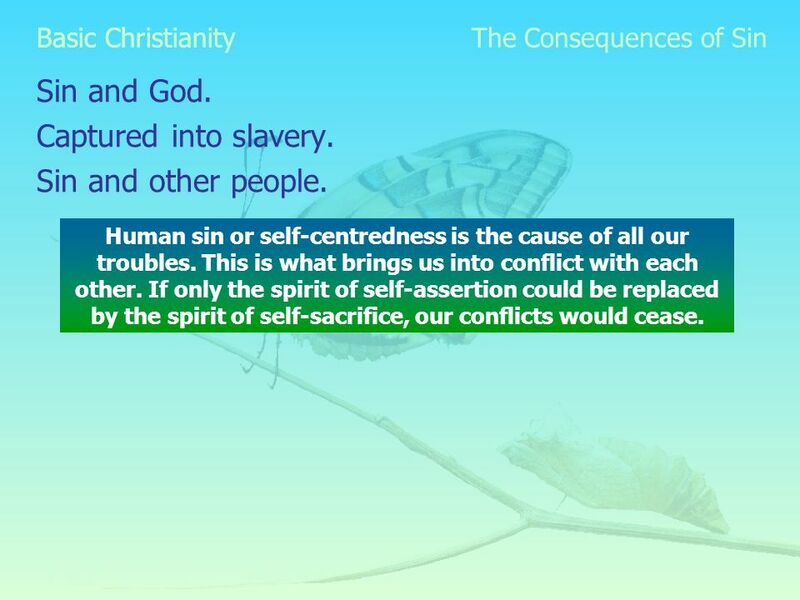 We must decide for ourselves. 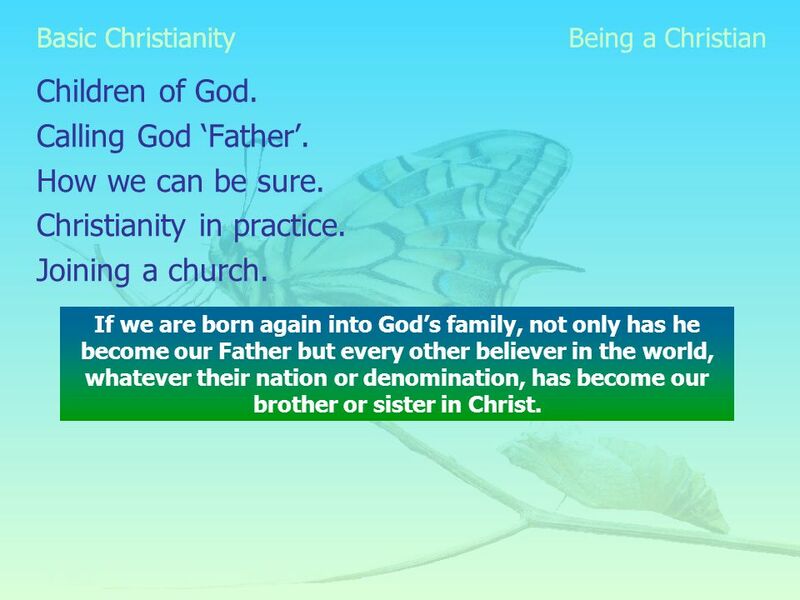 69 Basic Christianity Children of God. 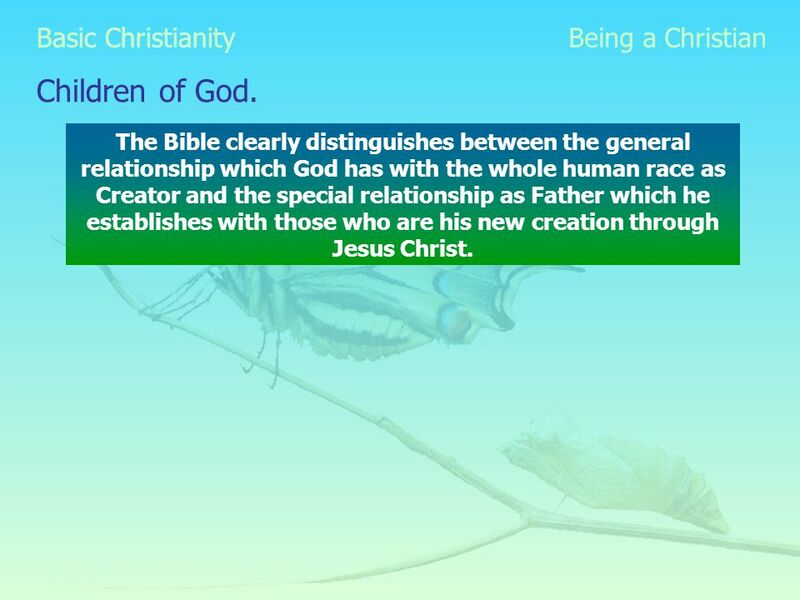 Being a Christian The Bible clearly distinguishes between the general relationship which God has with the whole human race as Creator and the special relationship as Father which he establishes with those who are his new creation through Jesus Christ. Download ppt "Basic Christianity. THE RIGHT APPROACH 1 Basic Christianity God takes the initiative. 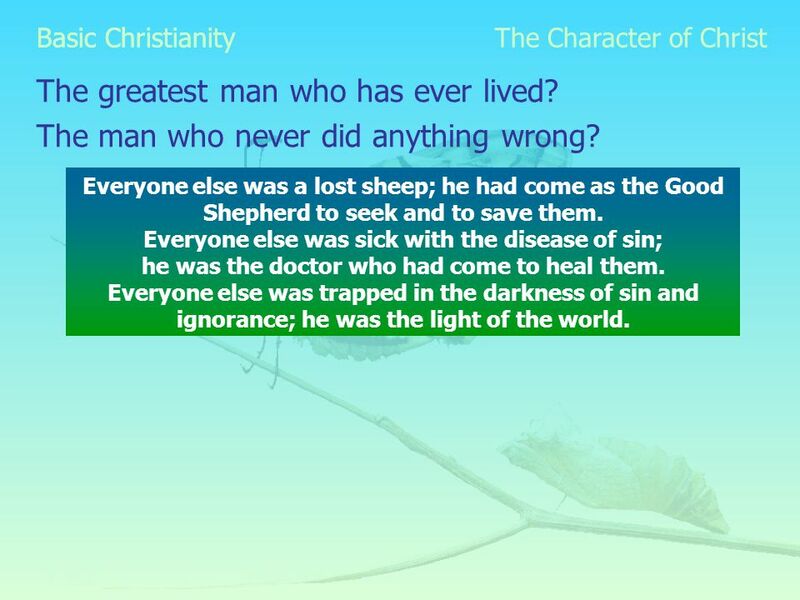 The Right Approach The Bible reveals a God who, long before it." 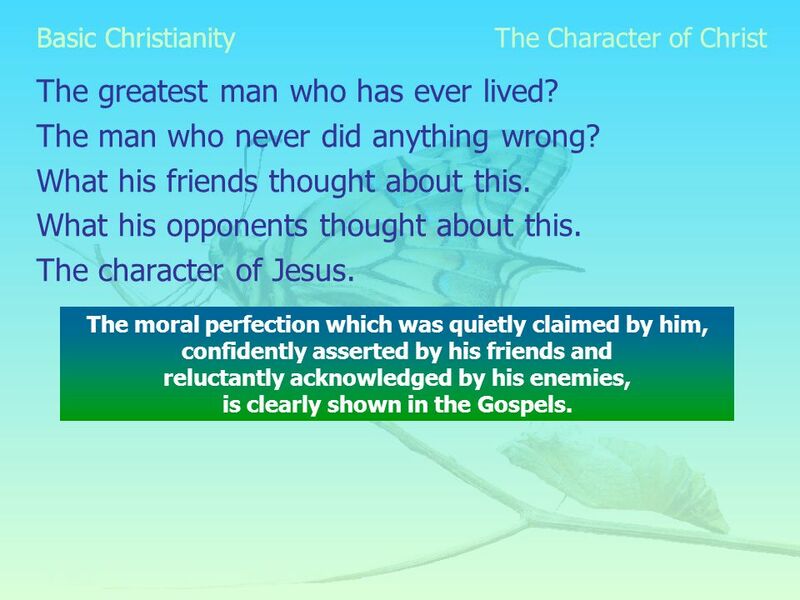 1 The Good News I invite you to consider the Good News of Jesus Christ and I invite you to surrender your life to the Lord Jesus. 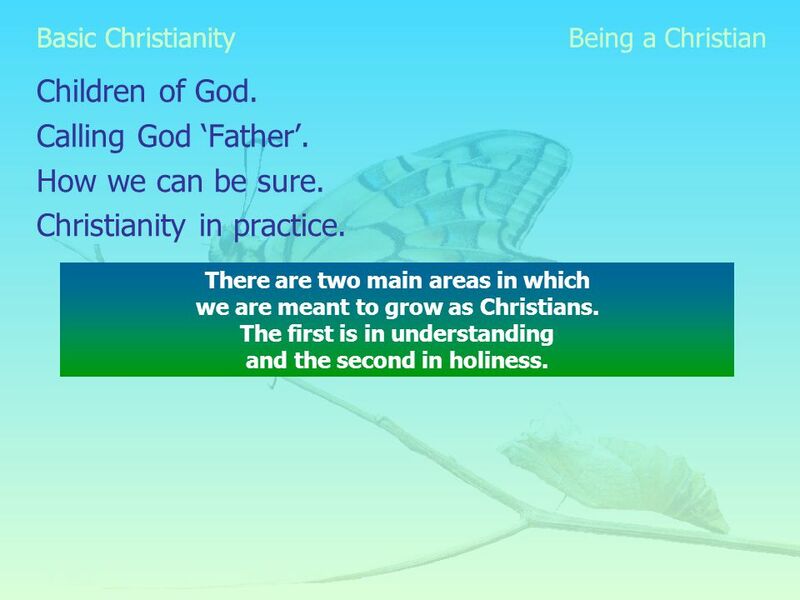 Easter 2014 Material taken from The Book of Common Prayer and New Patterns for Worship, © The Archbishops Council Also © the National Council. 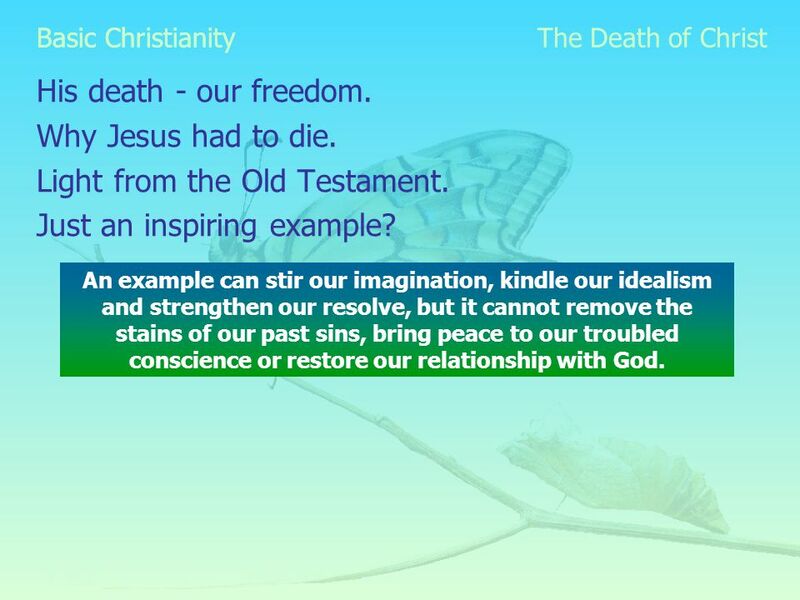 Christianity: Boring? Untrue? Irrelevant? 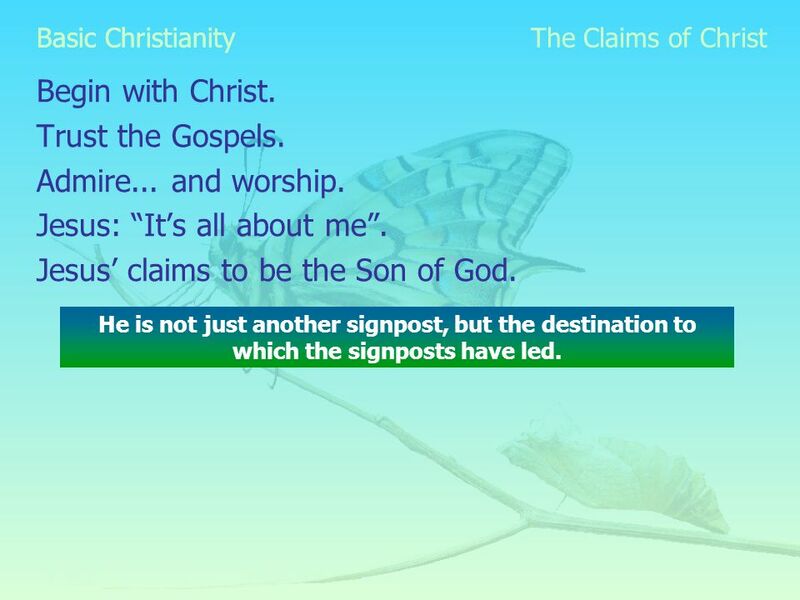 Jesus claims “I am the way, the truth and the life” – John 14:6. Trinity Lutheran Youth Group. Last Month Does God Exist? 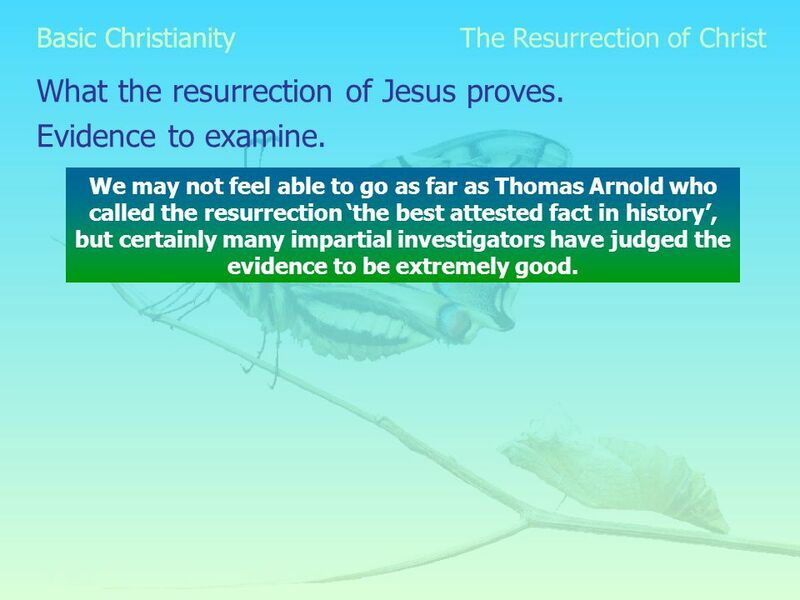 Evidence from Science Logic Evidence from History Experience. 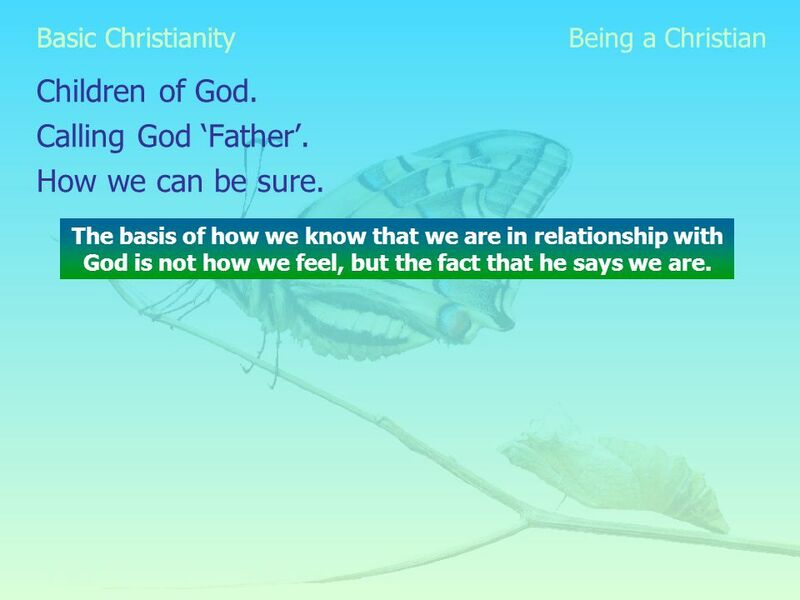 Personal Relationship July 17. 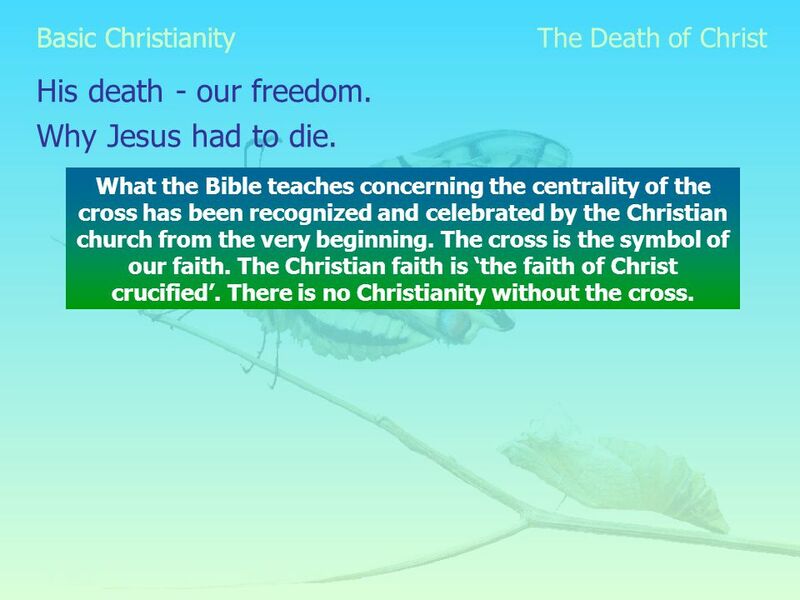 Think About It … What are some symbols of freedom? 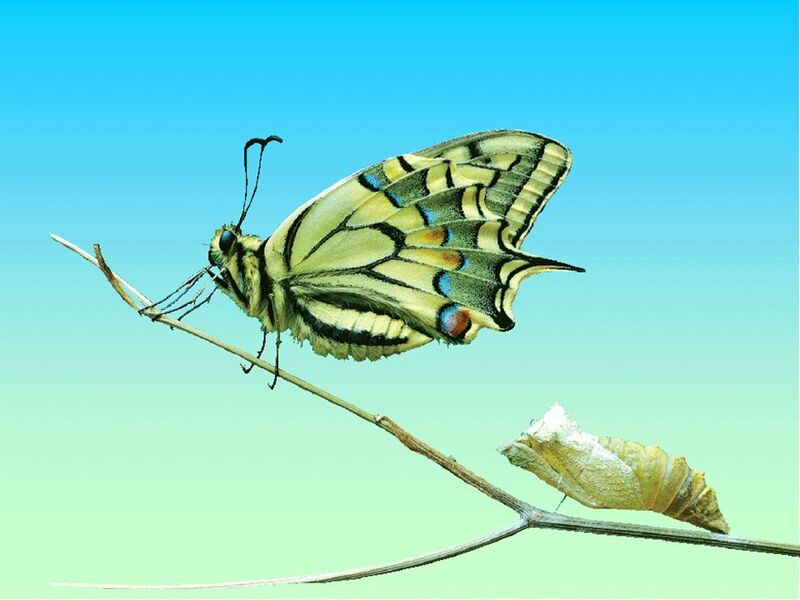 Today  we look at spiritual freedom We consider how to build it through. 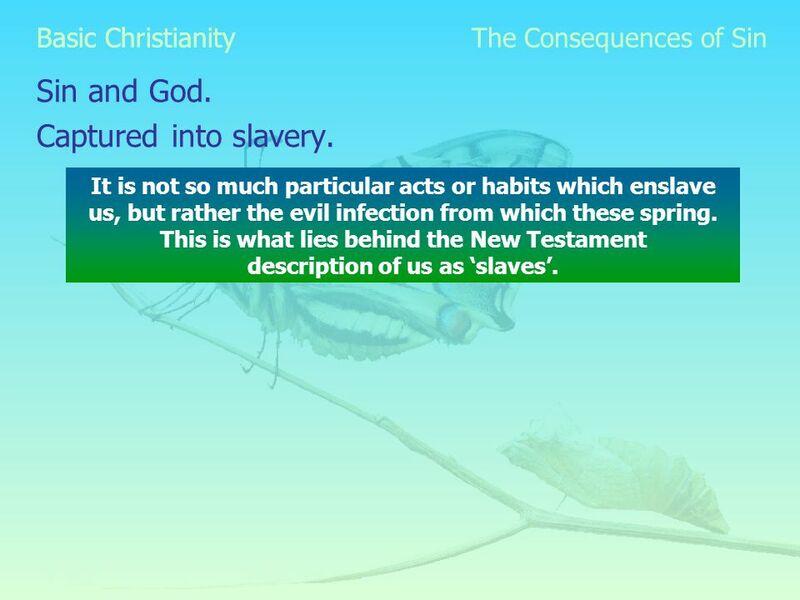 DISCIPLING CONVERTS. 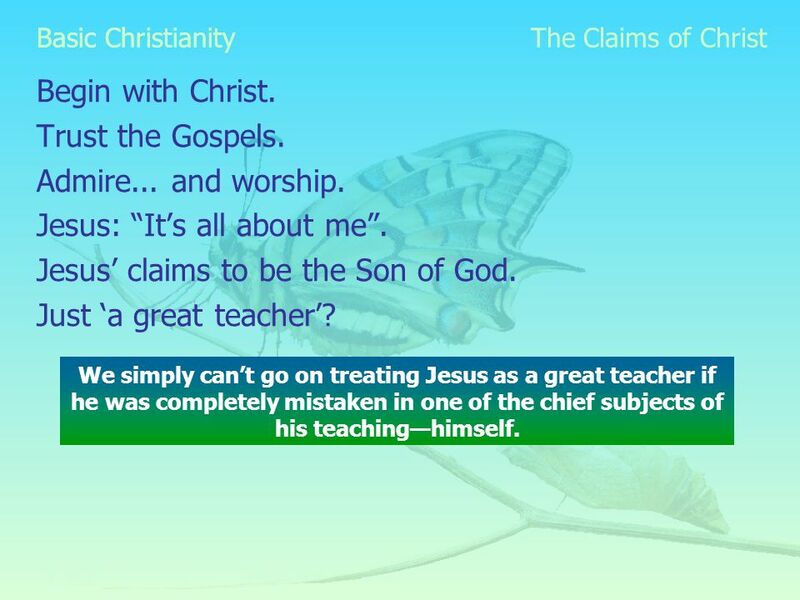 Matthew 28: 18 Then Jesus came to them and said, “All authority in heaven and on earth has been given to me. 19 Therefore go and. Certainty Of Things Believed Among Us Certainty - A Basic Need Of All Men – Before one is willing to make an "investment" in anything that costs Wants. I Believe ! Do You? © Neil Hodgson 5/6/2010 For full page right click on page and the left click on full page Then left click on page to proceed with Power. 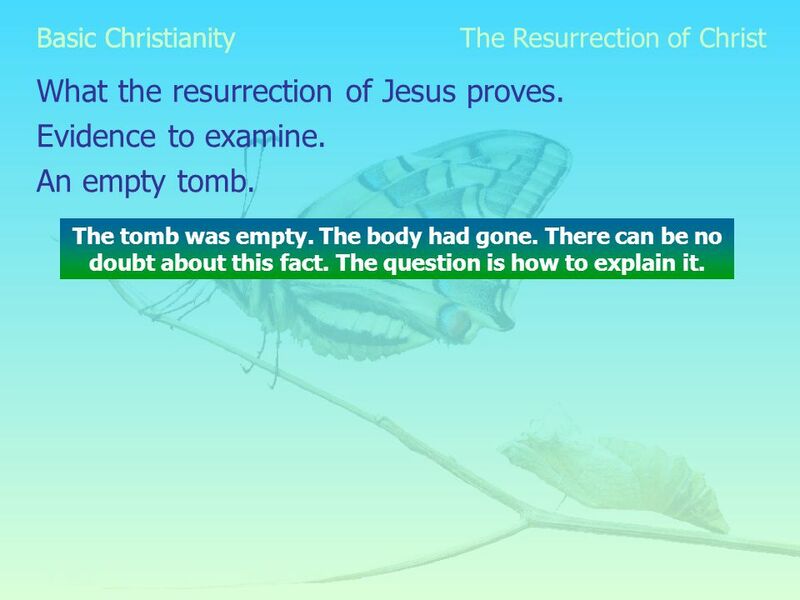 ICS 7 th Grade Religion.   Imagine you were leaving for a long trip, a trip that you might never return from. Imagine you left behind some important. Is Once Saved, Always Saved? 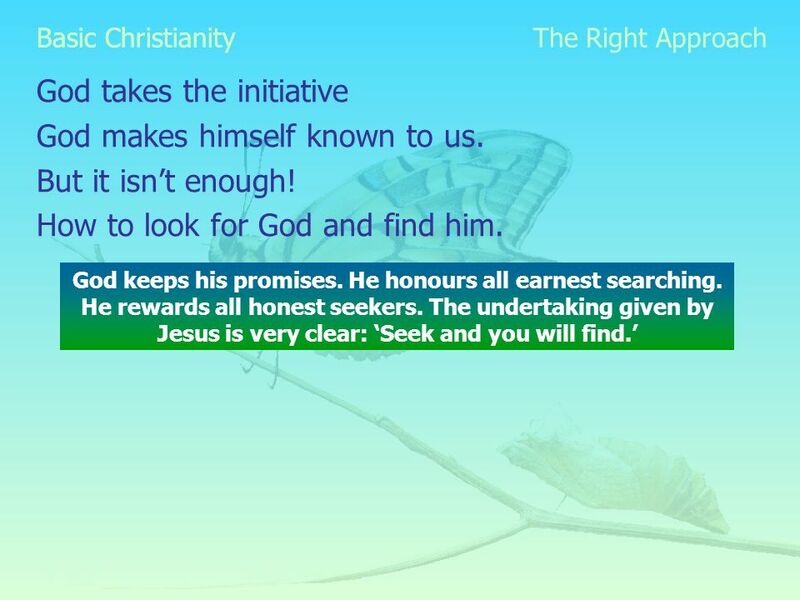 In His Holy Presence; hidden treasures and let’s worship Him! Part 2. 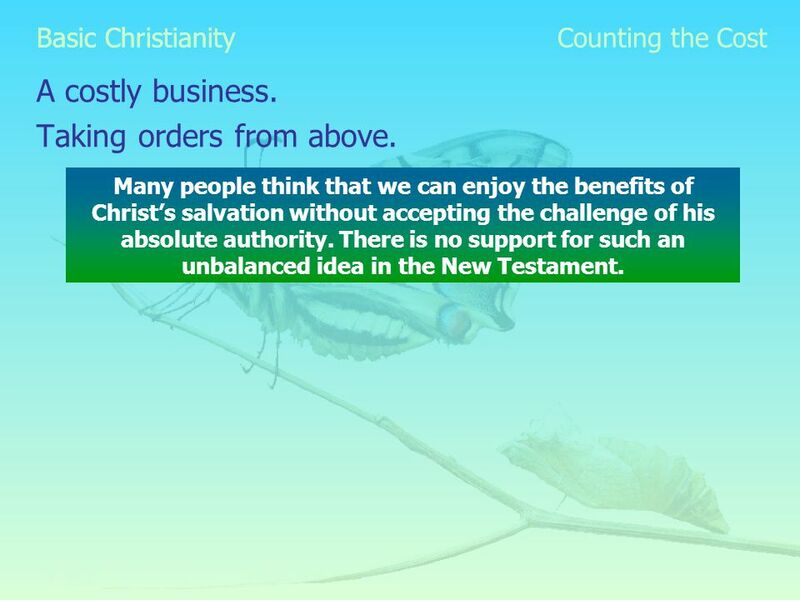 Doubtlessliving.com. Favorite Game? What is your favorite game to play with your friends and family? What is your favorite game to play with your friends. 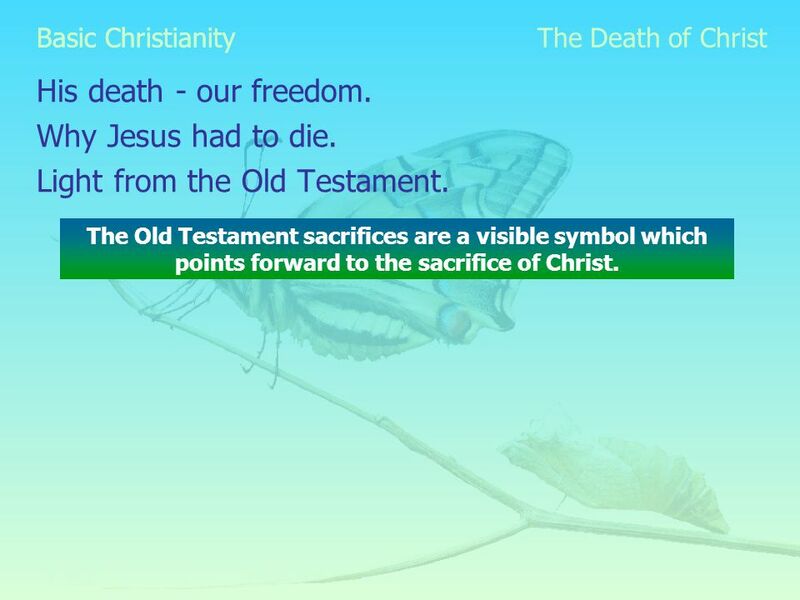 The Eternal Abode Of The Righteous Matthew 25:46 And these will go away into eternal punishment, but the righteous into eternal life.